In today’s paperless era all business critical data get stored digitally in huge data storage systems. Corporate & PSUs have different IT installations to meet the requirements of huge data management at various levels of head office, regional offices and branch offices. In these complex set-ups, if anything goes wrong with data OR the data is unavailable when required, then it may lead to heavy financial losses due to time-bound deadlines. For corporate/ PSUs it becomes critical to get “Data Recovery Services” promptly and in “NO TIME” in the hour of need. Stellar has carefully researched IT set-ups at various organizations and figured out some general type of IT set up at various levels and come up with unique deployment model which takes care of all your data safety and data recovery needs at all levels of the organization. Hybrid Deployment Model: The Model effectively combines Data Safety and Data Recovery Solutions in the form of “Software Suits” that ensure “Wherever you have data recovery need, Stellar is always there with you in the need of hour with the most suitable data recovery products & service options as the first level of deterrent to data loss situations”. Head Office At head office, IT department deploy mail servers, uses multiple operating systems, manage huge databases, take care of data back-up and data security concerns etc. Regional Office Regional offices use more than one operating system, emails, Microsoft Office documents and manage regional business data. Branch Offices Branch offices normally use Windows and manage small business data. Stellar has come up with unique deployment model which takes care of all your data safety and data recovery needs at all levels of the organization. Each Stellar phoenix suit is a perfect collection of popular Stellar Phoenix range of software to meet your organization requirements in creating the first level of deterrent to Data Loss. Each Stellar phoenix suit enables a basic computer user/ administrator to recover files/ folders, repair MS office files, e-mails and databases in a simple Do It Mode. Stellar data recovery software is “Easy to Use” and come with FREE one year 24 X 5 voice-based / e-mail support. 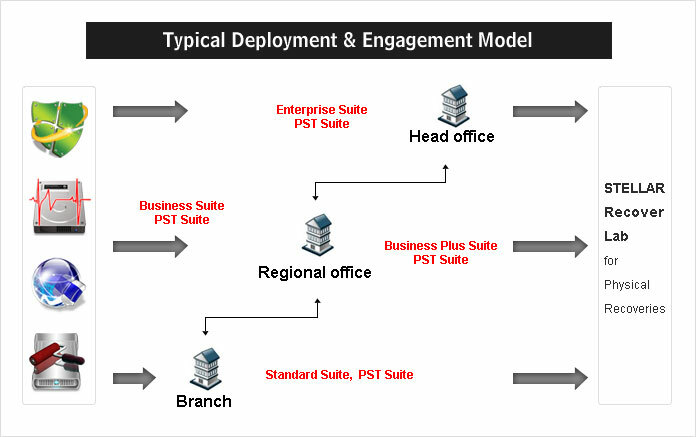 At Head Office & Corporate Office, we suggest Enterprise Suite & PST Suite. (Learn more about suits). AT Regional Office, we suggest Business Plus, Business & PST Suite. (Learn more about suits). AT Branch Offices, we suggest Standard & PST Suite (Learn more about suits). For data safety and data security requirements at all levels, we suggest Data Safety tools such as Instabackup Gold, Smart and data security tools such as Stellar Wipe, Disk Wipe. Lab data recovery services are required when the data storage media is inaccessible due to bad sectors, physical damage to hard drive components, the hard drive is making a clicking/ knocking sound, electrical/ mechanical failure of the hard drive, firmware problem etc. Stellar provides the widest range of data recovery services for all data storage media. Be it a single laptop/ desktop hard drive OR multiple combinations of the hard drive in Raid Servers, NAS/ SAN etc, Stellar ensures fast, secure and efficient data recovery services. 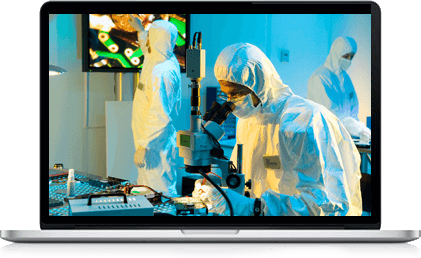 Stellar has experienced team of data recovery engineers, State of the art infrastructure of CLASS 100 CLEAN ROOM, in-house research & development and above all over 24 years of experience in the field of data recovery. Stellar provides data recovery services at 15 locations across India.